Rarely Available. Top Rated Property. Best Location, Pool/Bikes & More.. This house is located on a private beach lane, on a private estate called Kailua Gardens. You would enter the house up the stairs next to the pool. Please note the second bathroom is located downstairs next to the laundry/pool area. There are two other rentals on the property, the Sunshine Suite and the Palm Villa, which shares the pool. The best part is you just walk down a private beach lane and in less than 2 minutes you would be at Kailua Beach which is the most beautiful beach in the country! It is great for children. The water is calm since there is a coral reef 1/2 mile off shore, where the waves break. You can snorkel, swim, kayak, or just walk the beach for hours. You can also watch the sun rise in the morning over the ocean and the moon rise in the evening. It is truly breathtaking! Take a look at the photos below, and let us know if you would like to spend your vacation with us. We would love to have you stay. Aloha! Steve and I lived in Colorado for 10 years and had our first child, Sharly. She was 3 months premature and weighed in at a whopping 1 pound!! When she turned one, she weighed almost 10 pounds. Her doctor said that she would grow if we moved her to a warmer climate.. that it was difficult for her to maintain a 98.6 degree body temperature without burning so many calories. So, we moved to Hawaii.. with $500 in the bank and our little daughter. That was in December, 1979. And here we are 35 years later. Sharly has since married, given birth to our grandaughters, Kaylee and Riley, and has moved back to Colorado. We had our son, Zak after moving to Hawaii. He married his high school sweetheart, Amber, and they have 2 sons. And, he just began working for us full time! There's more to the story, so come and stay with us to hear the rest. We love our guests and have many repeat visitors to our lovely rentals. We bought our house before it became a vacation rental. We owned a small travel agency and people were always asking if there was anywhere to stay other than Waikiki. So we decided to rent out some rooms in our home to accommodate our clients and to make a little extra money. There were no hotels in our town and the beach was just gorgeous. 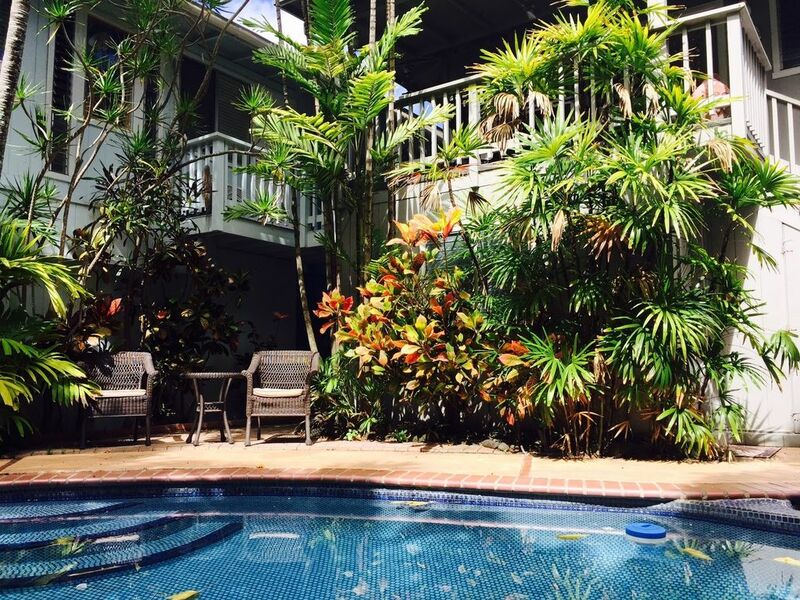 Little did we know that Kailua would become such a B&B mecca. You will love the hospitality and service we provide our guests. The beach is absolutely gorgeous and the property is like walking into Shangri La. Steve's gardens are breathtaking and the pool is beautiful. One minute walk to Kailua Beach Park. Private Gated Property, Walk to Beach, Free Wifi, Free Parking, AC in every room, Digital Cable TV with HBO, Gorgeous Swimming Pool, Jacuzzi, Full Kitchen, Gas BBQ, Bikes, Beach chairs/mats/toys/towels, Lush Tropical Gardens, discounts for longer stays.